Two years have done little to ease veterinarian Audra Hughes’s grief over her husband’s untimely death. Eager for a fresh start, Audra plans to leave Portland for a new job in Philadelphia. Her seven-year-old son, Jack, seems apprehensive about flying–but it’s just the beginning of an anxiety that grows to consume him. As Jack’s fears continue to surface in recurring and violent nightmares, Audra hardly recognizes the introverted boy he has become. Desperate, she traces snippets of information unearthed in Jack’s dreams, leading her to Sean Malloy, a struggling US Army veteran wounded in Afghanistan. 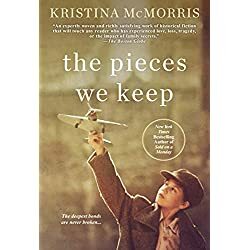 Together they unravel a mystery dating back to World War II, and uncover old family secrets that still have the strength to wound–and perhaps, at last, to heal. Intricate and beautifully written, The Pieces We Keep illuminates those moments when life asks us to reach beyond what we know and embrace what was once unthinkable.